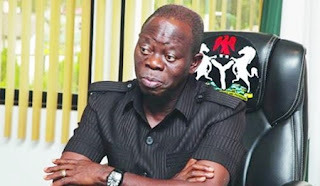 The National Chairman of the All Progressives Congress, Adams Oshiomhole, has said it will not be out of place to deploy soldiers in Ekiti State for the governorship elections scheduled to hold on Saturday. ttWhile speaking with journalists after a closed-door meeting with British High Commissioner to Nigeria, Paul Arkwright in Abuja, the APC National Chairman, Adams Oshiomhole, backed the deployment of military for the forthcoming governorship election in Ekiti State. The influential politician said that people should not dictate the number of police personnel to be deployed for the governorship poll to the Inspector General of Police (IGP) in order to secure lives and property. Oshiomhole who voiced APC's commitment to free and fair election in Ekiti, said the presence of adequate security personnel was necessary to the "rigging machine" serviced by criminals. He said, "Whether they should use the military or not, I don’t think you want to argue that. Over the years since 1999, 2003, the Armed Forces have always been deployed; don’t forget, when I was in Edo State, I told people that I want the armed forces to be involved in the election because the rigging machine is serviced by criminals who are hardened and who are often hired. "Now if you have criminals wielding AK 47 on an election day, and the police is overwhelmed, you want to say the army should not be deployed? We shouldn’t worry about who we deploy, I think we should all pray that however people are deployed, in the end, we are not counting dead bodies. “My experience in Edo is that you will hear stories like this, so, so people deployed....I have seen that in Edo. The important thing is that regardless of what the police chooses to do, regardless of the number they choose to deploy, let us ensure that those who are going to vote are safe and that the votes cast are secure, whatever number they need to secure the lives of those who are going to vote to create that sense of security for people to move freely to vote for candidates of their choice, I don’t think we should dictate to IGP how many people he wants to deploy." While speaking, the British High Commissioner, Arkwright said his country intended to send observers to Ekiti State to ensure credible poll because of interest in Nigeria’s democracy. “The British High Commission will be sending a team there to observe the election and to ensure that they go smoothly, to ensure that INEC can do its job, that the security forces do their job and basically to ensure that the people of Ekiti State are allowed to freely express their opinion, to vote along with their conscience and to be able to do so in peaceful manner,” Arkwright said.